The independent Golden League‘s Orange County Flyers announced last week that they had signed former Chicago Cubs All-Star pitcher Mark Prior. Pitching for the Chicago Cubs for 5 seasons beginning in 2002, Prior won 42 games. 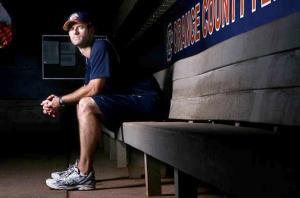 His best season came in 2003 when he went 18-6 with a 2.43 ERA. In 2004 the injury bug bit Prior, beginning with an achilles tendon injury followed up by elbow and shoulder injuries. Prior had major shoulder surgery, didn’t pitch in 2007 and was subsequently cut by the Cubs. The San Diego Padres took a chance on Prior but he had a recurrence of shoulder issues and he was released mid-season without ever having thrown a pitch. Since then Prior has been training under the watchful eye of pitching guru Tom House for 9 months. On June 30th, 20 scouts from Major League teams attended an open workout yet none extended Prior a single offer. Regardless, the work with Tom House seems to have paid off – Prior is throwing in the 90’s again. Both house and Prior believe that the path of least resistance to the big leagues lies in Prior pitching in a relief role -especially with the lack of quality relief pitchers available at the trade deadline. So far, so good – in one appearance, anyway. Prior pitched a scoreless sixth inning of relief in his Orange County Flyers debut, a 6-0 win over the Victoria Seals in the second game of Tuesday afternoon’s doubleheader. Prior retired the top of the Seals order, including striking out Tim Rodriguez to end the inning, before turning the ball over to closer Andre Simpson. Perhaps this will shed some hope on Dustin McGowan’s comeback from shoulder surgery, which is not unlike Mark Prior’s. Update: In 6 innings, Prior has dominated. He’s struck out 13 while walking only 3. So far so good! Previous articleWould Marcum Even Get Drafted in 2010? Something interesting to note is that during Prior’s MLB career, his playing weight was 225lbs. The Orange County Flyers website has him listed at 180lbs. That’s a weight cut of an astounding 45lbs! That’s 10 more lbs. than Tim Lincecum on a 6’5″ frame. Either there is an error with the Flyer’s scales or Prior will be pitching as a thin, thin man. I guess that degree in Communications isn’t worth falling back on. Loser. I saw Prior pitch a few times as well. His calf muscles were absolutely enormous. I always wondered if his physical breakdown wasn’t somehow related to performance enhancing drugs. He started to break down after the drug testing/bans came into play. I realize it has been a long time since he last played but I do wonder about the weight drop….225 to 180?